How to get there: From Athens, drive north (direction Lamia) on Hwy. E-75. Exit one km after a toll plaza towards Halkida. You will cross a fairly large bridge, about 2 km later you come to the first traffic light after the bridge. Measure from this light. Proceed straight ahead through the traffic light intersection. You will drive under a ruin (aquaduct), then come to a second light where you continue straight. You are now going towards the sea and a traffic light at km 1.5. Turn right and continue into Néa Artáki. Turn right at km 7.0 (this is in the middle of town), and continue 14 km to the village Katheni at km 21. Continue towards the small village of Steni, stay right at km 24, and arrive in Steni around km 29. From Steni, continue along the (only) main road as it climbs for 8 km to a mountain pass at km 37. There is parking on the left side of the road. Alternatively, continue on a dirt road that goes left at the pass in the direction of the clearly visible peak. There is a (closed?) mountain refuge at km 39. Park your car here. The refuge is at location N38:36.620, E023:51.628, with an elevation of 1127 meter. Route description: From the refuge, continue along the dirt road towards the mountain. One may actually drive all the way to the saddle that defines the base of the mountain, however I would recommend not to do this, but rather enjoy approaching the peak on foot. Within 15 minutes one has reached the saddle, location N38:37.087, E023:51.199, elevation 1109 meter. The route heads directly up the ridge in front of you. There is a pretty good trail, marked with red paint, but it is sufficiently steep and rough to carry a YDS class 2 designation. As the horizon gets closer and you expect to hit the summit, you realize that this mountain is indeed pretty flat on a good sized plateau. The highest point turns out to be opposite of where the route ascends the plateau. 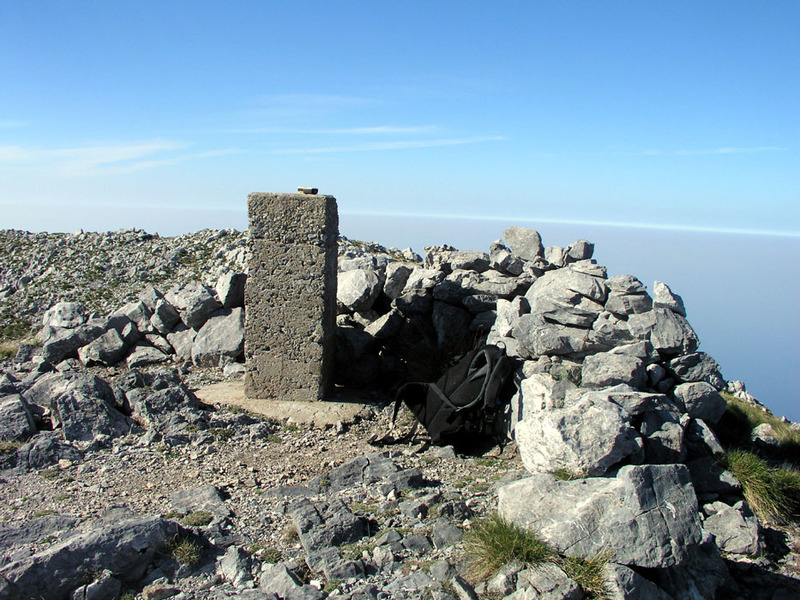 Besides the highest summit as recorded above, there are two points nearer to the ascending ridge, a point marked with a cross and a concrete cairn at elevation 1742 meter, at N38:37.484, E023:50.619, and a point 1739 meter at N38:37.441, E023:50.575. Comments: This climb came about in a most unusual way. After my climbs on Sunday, September 12, I was now again back at the applied mathematics conference near the town of Halkida with no further time or plans for hiking. In the early afternoon, I drove professor Susanne Brenner (a good friend from South Carolina) back to the hotel. She had given the main talk of the day and asked if I could take her back to the hotel a bit early. We had discussed some issues related to her talk and this suited me well. I had hardly looked around the hotel and it would be good to enjoy the Greek summer for a few hours on this last day before flying back to Norway the next morning. 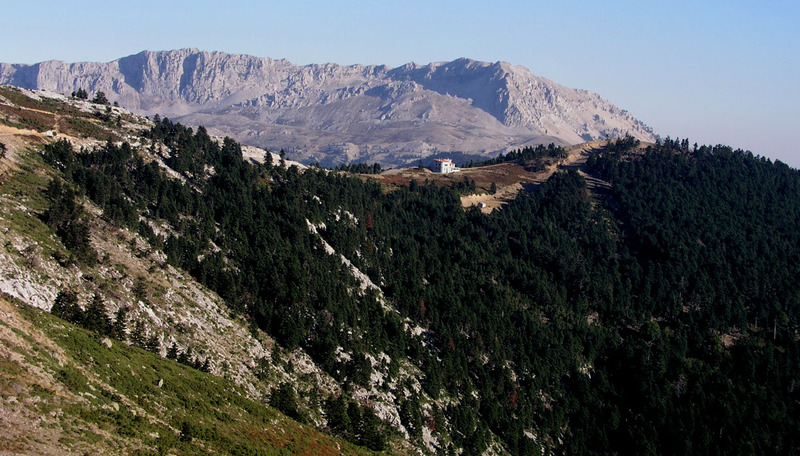 This was my first ever visit to mainland Greece and when selecting possible hiking goals I had listed the high prominence peaks on the mainland. Somehow, I suddenly came to realize that I was indeed staying in this hotel on an island, not on the mainland. This island, Évia, is connected to the mainland by a very small, short bridge, so I had not even understood that the conference was on an island. (When arriving from the north as I did, the bridge connecting towards Athens is bigger.) Was it possible that this island had a high peak that I had not even considered? A quick check revealed that this was in fact true, Dirfis at more than 1700 meter. The peak was only about 55 km from the conference hotel, here I had been driving all over Greece hunting large mountains and then here is one in my "backyard" that I was about to leave behind. With only a few hours of daylight left, I needed to locate a trailhead and hope that the hike was not excessively long. I tried to find a map, but with no luck, better not waste time on this, jump in the car and hope for the best. Luck was with me, the approach was pretty obvious. I parked the car at the (locked and closed) mountain refuge at 1530 in the afternoon and hiked to the somewhat lower saddle (1109 m) at the mountain base, arriving there at 1545. 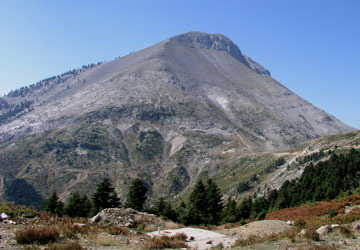 The 640 meter climb to the summit plateau took only 45 minutes. I spent another 45 minutes resting, enjoying the view, taking pictures and hiking across the summit area taking GPS measurements on three different locations. I measured the highest point to 1749 meter, while the lower summit that you first arrive at was 1743. Either the GPS was (suddenly) too high here, or the official elevation may read a bit low. The descent and hike back to the car took another hour, thus the project was completed by 1815. It would have been just TOO BAD if I had "discovered" this peak after my return to Norway. Dirfis as seen from the villages on the west side. Dirfis as seen from the refuge and normal approach. The route heads directly up the curved ridge from the saddle at the base. View south from the south summit. This is the summit visible from the road, note the cross. The refuge as seen when descending the ridge. 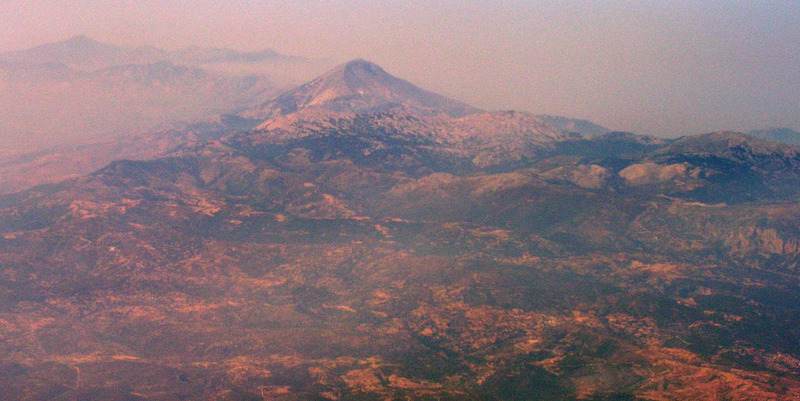 Dirfis as seen from the air.